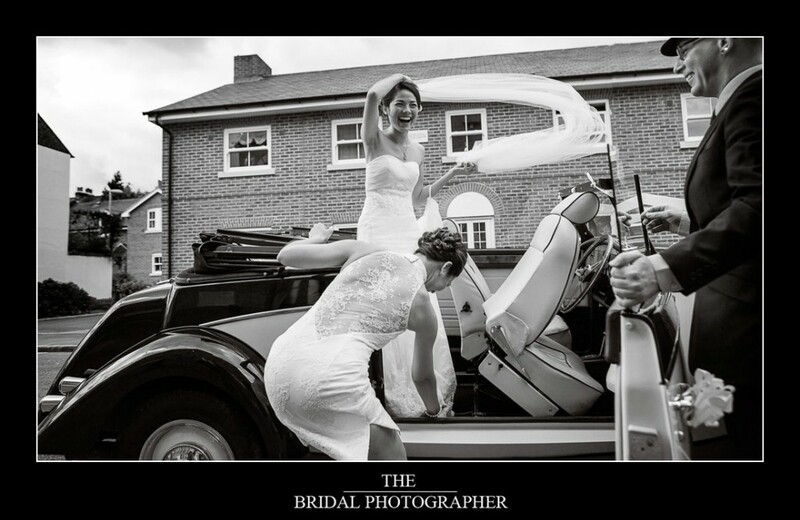 Absolutely over the moon to find out that one of my favourite Wedding Photojournalism images has been awarded Highly Commended in the International SWPP monthly images competition for March 2013. The competition is open to professional wedding photographers all over the world and the standard is incredibly high so it becomes tougher and tougher to get these awards. I have been fortunate to score a few Highly Commended images in the past and even a couple of the coveted Golds which are a bit like hens teeth!! The image is from a wedding at The Mill House Hotel in Shinfield Berkshire at a very windy June 2012 wedding. The bride Sonia had arrived at the church in a droptop vintage Bentley when the wind reached a crescendo blowing her veil in an arc, you can see the surprise on her face but she was quick as a flash and kept it in place. Moments like this happen in a split second and part of the skill wedding photojournalists develop is a true sense of anticipation and moments like this happen and are captured in a single shutter click, hesitate and the moment is gone, it all comes with experience, you don’t nail it 100% of the time but when you do it is priceless and what it takes to be an Award Winning Oxford Wedding Photographer.